A French composer born in 1935 in Clermont Ferrand. Born into a family of musicians, François-Bernard Mâche attended the École Normale Supérieure, is an ‘agrégé’ in letters, and has a diploma in archaeology (1958). A pupil of Olivier Messiaen, he was also a founder member of the Groupe de Recherches Musicales, is a doctor in musicology (1980), and has been director of studies at the EHESS since 1993 and a member of the Académie des Beaux-Arts since 2002 in the seat of Iannis Xenakis. Pursuing parallel activities of musical creation and university work, Mâche has throughout his career developed a personal theory and method of composition: his Hellenic culture, his interest for mythology appears in many works, and he also cultivates a naturalist æsthetic by integrating, notably, the natural sounds of birds. He focusses in particular on literary and archaeological models and archetypes. His output has received many awards and is played throughout the world. His works include Korwar (1972), Da Capo (1976), Kassandra (1977), Rituel pour les mangeurs d'ombre (1979), Temboctou (1981), Trois chants sacrés (1984), La traversée de l'Afrique (1985), Cassiopée (1988), Maponos (1990), Athanor (1991), L'estuaire du temps (1993), Les 12 Lunes du Serpent (2001), Taranis (2005). Born to a cellist father and violinist mother, François-Bernard Mâche was initiated into music at a very early age and particularly the piano. He studied music at the Clermont-Ferrand Conservatory where he composed his first pieces for piano (Berceuse, Elégie). He won a piano prize in 1951 and a harmony prize the following year (in Émile Passani’s class). He then put music to one side in order to prepare the entry competition for the École Normale Supérieure. He joined it in the letters department and obtained, in 1956, a degree in classics. The following year he took an advanced diploma in Greek archaeology and became, in 1958, an ‘agrégé’ in classics. 1958 was a watershed year, marking his entry into the Paris Conservatory in the class of Olivier Messiaen as well as his début with the Groupe de Recherches Musicales (GRM) of French radio-television, a group that had just been founded by Pierre Schaeffer. He then composed, in 1959, Prélude and Lanterne magique, both for recorded sounds. He was active teaching letters at the Collège Sévigné and at the same time taking a class in the history of ancient art at the Institut d’Art et d’Archéologie at Paris University. In 1960 he won the music philosophy prize in Messiaen’s class before leaving to undertake his military service in Algeria as a sub-lieutenant (October 1960 to September 1962). On his return from Algeria in 1962, he taught letters at the Lycée Marceau in Chartres, and was in charge of the GRM. His initial training, at once literary, archaeological and musical, comes together in his work as a whole: he exploits the musical potential of the texts but also uses rare, dead or exotic languages. As early as 1959 he effected instrumental transpositions of the phonetic structure of a Greek poem in Safous mélè. In this way he developed composition techniques from natural or linguistic models. He later produced methods of structural analysis inspired by his linguistic studies. As a Hellenist he found inspiration in ancient myths, and a large part of his creative output has been marked by Greek mythology translated by him into music (Danaé, Andromède, Kassandra). In 1963 he ended his collaboration with the GRM. He then pursued compositional and theoretical research on his own, without any compromise with the dominant æsthetics and trends, developing a personal theory and method of composition centred upon notions of model and archetype. Temperamentally opposed to post-serial trends, that appear as highly complex combinations divorced from reality, he interested himself in purely sensorial data, using on the one hand languages he did not know and treated as purely aural material, and on the other hand sounds/noises recorded straight, without any transformation. He was a pioneer in composing Le son d’une voix in 1964, and in using sonogramme analysis to develop instrumental writing, prefiguring the so-called spectral school. While still continuing his composing activities, François-Bernard Mâche has led a career as teacher in French national education, in Chartres, Neuilly-sur-Seine and finally at Louis-le-Grand in Paris. He abandoned classics in 1980, after having received a doctorate in letters and the humanities for a thesis entitled “The idea of model in today’s music”, presented at the Sorbonne under the direction of Iannis Xenakis. In 1981 he gave classes at the University of Paris-I (Sorbonne) on “Musical composition in the biosphere”. In 1983 he was appointed teacher of musicology at the University of Strasburg-II and in 1987 he set up the Primus Centre for training sound engineers, the first of its kind in France. He left Strasburg in 1993 following his appointment as director of studies at the École des Hautes Études en Sciences Sociales (EHESS). François-Bernard Mâche, who has always pursued several careers at once, has been a broadcast producer for France Musique (Le musicien et son modèle in 1976) and France Culture, but was also the deviser and organiser of an exhibition (La Voix maintenant et ailleurs at the Centre Pompidou), and of an international seminar on musical analysis in Strasburg in 1985. As a lecturer he has taken part in international seminars (Seoul in 1997, Brussels in 2000, Palermo in 2004, et al. ), and speaks in conservatories and universities, as well as at the École des Hautes Études en Sciences Sociales (EHESS) and at the Collège de France. He is a member of university juries and composition juries (including the Prix de Rome in 1989). As a musicologist, Mâche is the author of more than 100 articles on music in periodicals such as Mercure de France, La Revue Musicale and Nouvelle Revue Française, and has published much musicological work including Musique mythe nature (1983), Entre l’observatoire et l’atelier (1998), Un demi-siècle de musique et toujours contemporaine (2000) and Musique au singulier (2001). Frequently allying loud-speakers and acoustic instruments, his compositions have an international presence, for example Korwar (1972), Temboctou (1982), Manuel de résurrection (1998), Taranis (2005). He has been invited to more than twenty countries, including Poland, Iran, Finland, Israel, Japan, Argentina, the United States, China, Mexico and Korea. His compositions have won many prizes: prize of the Biennale de Paris in 1963, Enesco Prize of the Sacem in 1964, Prix Italia in 1977, Prix Chartier of the Académie des Beaux-Arts in 1984, Grand Prix National for music in 1988, Prix Rossini of the Académie des Beaux-Arts in 1998, Grand Prix for symphonic music of the Sacem in 2002. 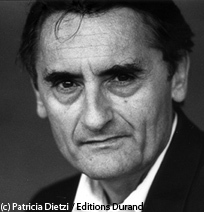 He was appointed Officier des Arts et des Lettres in 1985, then Commandeur des Arts et des Lettres in 1990. In 2002 he was elected to the Institut de France, the Académie des Beaux-Arts, in the seat previously occupied by his friend Iannis Xenakis, who had died one year earlier. Création : 03/09/1970 – Solistes des chœurs de l'ORTF, Jean-Pierre Drouet, direction Marcel Couraud. Téhéran, Persépolis, ruines du Palais de Darius, festival des arts de Chiraz-Persépolis. BAYER Francis. Sous le signe du réel : autour de l'œuvre de François-Bernard Mâche. In : NOGUEZ Dominique (dir.). Musique présente. Toulouse : Privat, 1982, p. 93-106 (Revue d'esthétique : nouvelle série). BIGET Michelle (dir.). Les cahiers du Cirem, 1992, n° 22-23, 210 p. Numéro consacré à François-Bernard Mâche. CADIEU Martine. Entretien avec F-B. Mâche. Les Lettres françaises, juillet 1968, n° 1241. CHARLES Daniel. Petite introduction à l'esthétique de F-B. Mâche. In Musiques nomades. Kimé, 1998, p. 172-186. CHEYREZY Ch. Scénographie du récit dans le théâtre musical : à propos de "Temboctou" de F-B. Mâche. In Les modèles dans l'art. Presses Universitaires de Strasbourg, 1997 p. 157-165. FACCARELLO Gilbert. F-B. Mâche, mouvement purement logique et pure logique du mouvement. Musique de tous les temps, Janvier-février 1974, n° 16. MÂCHE François-Bernard. Xenakis et la nature. L'arc, 1972, n° 51, p. 50-55. MÂCHE François-Bernard. La paperasserie musicale. Musique en jeu, novembre 1978, n° 33, p.35-37. MÂCHE François-Bernard. Musique, mythe, nature ou les dauphins d'Arion. Paris, Klincksieck, 1983, 136 p. (Collection d'esthétique). MÂCHE François-Bernard. La voix : maintenant et ailleurs. Paris : BPI : Fondation Royaumont, 1985, 68 p.
MÂCHE François-Bernard. Entre l'observatoire et l'atelier. Paris : Kimé, 1998, 218 p.
MÂCHE François-Bernard. Musique au singulier. Paris : Odile Jacob, 2001, 310 p.
MÂCHE François-Bernard (dir.). Portrait(s) de Iannis Xenakis. Paris : BnF, 2001, 227 p. (Portrait(s)). MARI Pierrette. François-Bernard Mâche : chantre du son brut. L'Éducation musicale, mai-juin 2004, n° 513-514, p. 36-37. MASSIN Brigitte. F-B. Mâche : l'âge freudien de la musique. Panorama de la musique, janvier 1980, n° 33. PISTONE Danièle (dir.). L'universel et l'utopique : hommage à François-Bernard Mâche. Paris : Observatoire musical français, 2006, 185 p.
ROY Domitille. F-B. Mâche : le plaisir du son. Culture et communication, juin 1978, n° 9. SÉJOURNÉ Emmanuel. Phénix de F-B. Mâche. Percussions, juillet-août 1998, n° 58, p. 7-15. SERROU Bruno. François-Bernard Mâche : de la musique, des langues et des oiseaux. Paris : Michel de Maule ; Bry-sur-Marne : Institut national de l'audiovisuel, 2007, 310 p. (Collection Paroles de musicien). SOLOMOS Makis. La virtuosité du montage chez François-Bernard Mâche. Analyse musicale, décembre 2005, n° 52, p. 76-85.